This is 12 Gauge Nobel Sport Low Recoil 2 3/4" 7/8oz. #8 Shot Ammo. 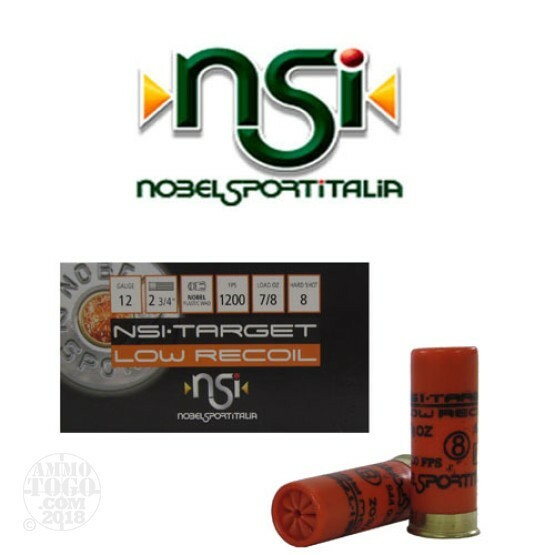 This Shotgun Ammo is manufactured by NobelSportItalia in Italy. Loaded with proprietary powder to burn clean and produce maximum velocity with the least possible recoil, NOBELSPORT supplies a new generation of soft shooting, hard hitting target loads. Hard shot, NOBELSPORT wads, primers and high quality casings are the final guarantee of competition quality. This ammo is packed in 25rd. boxes 10 boxes per case. Muzzle Velocity: 1200 fps.